The funeral of Mrs. Arthur Matthews will be held tomorrow afternoon at 2:30 o'clock, from the home of her daughter, Mrs. Floyd Hunter, of 301 Philadelphia avenue, West Pittston. Services will be held at the home and will be in charge of Rev. A.D. Decker. Interment will be made in the Pittston cemetery. This week in my Amanuensis Monday posts of my grandfather's auto biography we came to the death of his mother, Ada Merritt Hobbs Matthews. During the week I have posted her headstone (Tombstone Tuesday) and photos of her (Friday's Faces from the Past) and now we come to her obituary from The Scranton Republican which I found on newspapers.com. Newspapers.com has been an amazing source of information for me about my grandfather's family and even some of his cousins because they have the local paper from Pittston, PA and others from the area. Aside from the usual obituaries and marriage announcements, I discovered that my great-uncle Fred Matthews lost a home and business to a fire in 1910 when he was married with two children, that my grandfather's family were victims of a burglary in 1908 when my grandfather was only 7, I found advertisements for my great-grandfather's shoe factory, the "Want Ads" they placed when they were looking for house help and even my grandfather's letter to Santa in 1909 when he was 8 years old! Even with a common last name like Matthews, I was able to find all this in part by limiting searches to just their local papers. Additionally, I soon realized that most articles referenced their street name as in "Arthur Matthews of Nafus street.". Having this unusual name in my searches was also a help, and once I started using it I found a host of things I wouldn't have found otherwise. By the way, I am not being paid or compensated in any way for this post, I am just a grateful fan. 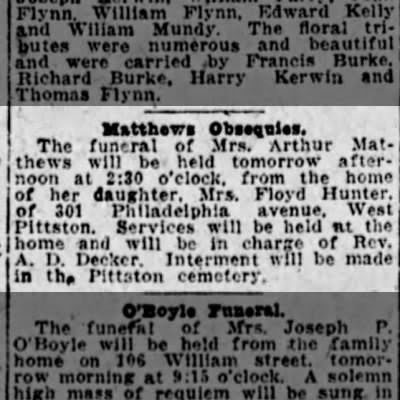 Obituary from The Scranton Republican, 3 Sep 1919, Wed, Page 4; Newspapers.com, accessed 12 Feb 2015.